Golden Apples: Hey, It's September! Yes, I HAVE Been Knitting. 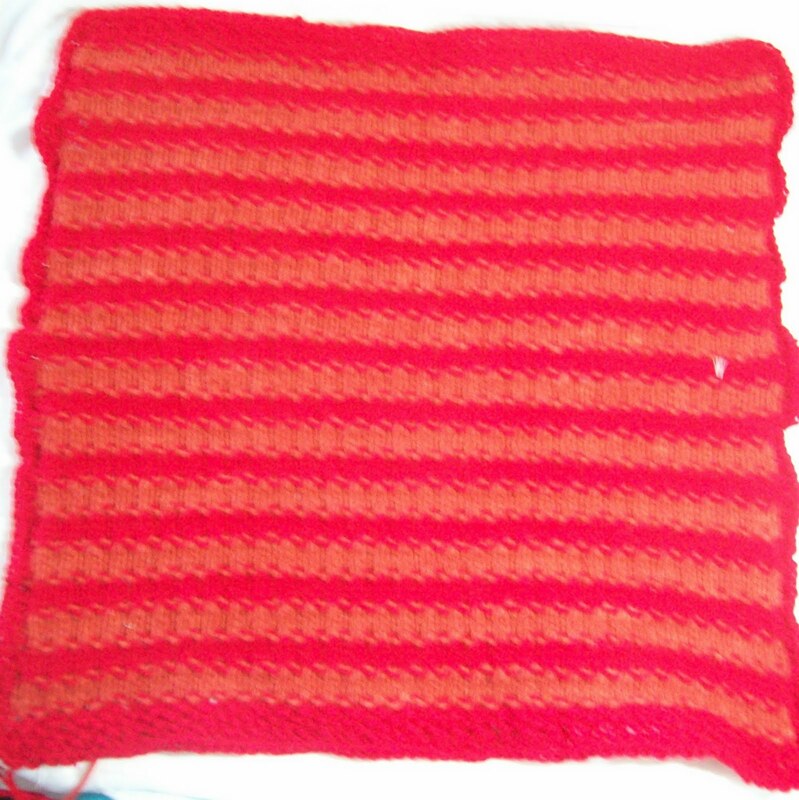 So once again, for block 4, I cast on 65 as I did for block 3—and ended up with a 19 inch block! 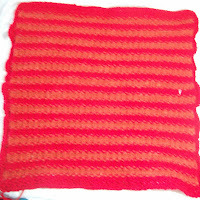 In some ways it was a good thing—I ended the last rust red stripe with 4 inches of yarn left over. IF I had just a few more (2!) stitches in each row, I would have run out of the rust yarn. The stripes are much more evident in this image--(well lit with an Ott type light) but the stripes are almost invisible from a short (6 foot or so) distance—and will be even less visible from 20 feet (the distance, I am guessing from a car to the side of the road) and even less so at 20 to 30 mph. Today or tomorrow, I will put the squares in a bag, and run them over to Robyn—the deadline is Sunday the 5th –So time is just about up, too. But it's September—and I have been itching to start my Pumpkin Pie socks--and I can! These socks will be pretty simple (mostly stocking knit)--but will be a new technique for me—Soles knit in one yarn, insteps in another. I've seen (and read in the past) EZ technique for doing this (she mended socks, and like being able to just unravel the sole part of the sock) And I understand the general principle—so I am just going to wing it. I know how to knit up seams as I go- I'll start at the crimped “crust” knit the leg, and then add more 'crust' at the heel and down the sole. And I already have plans for another pair of 'pastry' socks using the same technique for next year--my Cookie socks. Either I will get it right the first time, and do a repeat—or I will fall short of perfection, --with the pie socks, (or as near to perfection as I aim) and do my 'cookie' sock better. Naturally, Dragon socks will feature a lot of red! Hey—I have red yarn that was planned for this year (and won't be knit up this year)—other sock ideas were subbed--like the home dyed purple stuff I will be knitting up at the end of the year. Car problems and pool have keep me from shopping--and It's true--If I don't see any yarns, I don't buy any! No matter how good the sale or the coupon, if I am in the pool, I am not out and about, and just stopping into a store to see what's new--and walking out with more sock yarn! So far the line up for 2012 includes, Cookies, and Dragons, and another pair of beaded socks, the multi color Swirl socks (these may end up being December's socks) and some other solid, and patterned socks, and some colorwork socks.. (I've already forgotten all the details of the list!) but about 8 pairs with patterns and 4 plain (self striping/patterning) pairs--Including, now that I think about it an other version of the Puffy socks--Yellow I think, followed by cream, and then 4 shades of brown, ending in chocolate. Good thing I wrote the ideas down (the list in in another room). Some time in January, I wrotet up this years plain. So far, I done most of the socks I planned in January. I've done the granite socks, and the denim, and the repeat (in blue) of the raspberry swirl. Italian ices, check, puffy sock, ditto. Pumpkin pie (on deck), crazy 8's ready to go next month. I've done some different 'plain socks'--(generic socks for the most part, that rely on self striping yarns for a pattern)--but really does it matter that I did a steel and dove grey sock vs one of white and pastel colors? That's a lot of socks!